Yes, we have lotsa colour in the latest shipment of Desigual‘s Spring-Summer 2019 collection, which arrived Monday, April 1. Everything is 20% off during our Mid Season Sale at Angel. Desigual BOONE surfer shirt. $135.95. SS2019. Desigual VAN GOGH T-shirt. $75.95. SS2019. Desigual EXETER T-shirt. $75.95. SS2019. There are Exotic Denim jeans for women (one pair, called Maitai, are embroidered with cocktails). We also have some amazing dresses with fruit and fish, T-shirts with flamingos, pineapples and a landscape that looks like it was painted by Vincent Van Gogh. We’ve also got a cool-blue surfer shirt for men and a crazy yellow dress for girls. There’s even new Desigual baby dresses. (More later on new Desigual for men & kids – there are only so many hours in a day!). Desigual COCKTEL T-shirt. $105.95. SS2019. Desigual MINERVA dress. $169.95. Spring-Summer 2019. Desigual ANNA cotton dress. $125.95. Spring-Summer 2019. Desigual ANNA dress. $125.95. Spring-Summer 2019. Desigual KIONA cotton jacket. $205.95. Spring-Summer 2019. Desigual KIONA cotton jacket. $205.95. SS2019. Desigual GRACE dress. $148.95. Spring-Summer 2019 collection. Desigual GRACE dress. $149.95. Spring-Summer 2019. Desigual CALESI dress. $165.95. Spring-Summer 2019 collection. Desigual CALESI dress. $165.95. Spring-Summer 2019. Desigual BROOKLYN dress. $188.95. Made in Morocco. Spring-Summer 2019. Desigual BRUSH dress. $135.95. Made in Spain. Spring-Summer 2019. Desigual NIKA fruit dress. $135.95. Spring-Summer 2019. Desigual NIKA fruit dress. $135.95. Desigual LENA cotton dress. $125.95. Spring-Summer 2019. Desigual FIONA dress. $149.95. Spring-Summer 2019. Desigual FIONA dress. $149.95. Spring-Summer 2019 collection. Desigual COLETTE blouse. $105.95.Spring-Summer 2019. Desigual EXETER T-shirt. $75.95. Spring-Summer 2019. Desigual VAN GOGH cotton T-shirt. $75.95. Spring-Summer 2019. Desigual VAN GOGH T-shirt. $75.95. Desigual GINEBRA cotton safari jacket. $269.95. Spring-Summer 2019. Desigual GINEBRA safari jacket. $269.95. Desigual YAMILA T-shirt. $105.95. Spring-Summer 2019. Desigual JUNO cotton jeans. $189.95. Made in Turkey. Spring-Summer 2019. Desigual JUNO cotton jeans. $189.95. SS2019. Made in Turkey. Desigual MAITAI denim jeans. $168.95. Spring-Summer 2019. Desigual PLATEA cotton denim short with floral skirt. $169.95. Spring-Summer 2019. Desigual PLATEA denim short with floral skirt. $169.95. SS2019. Desigual PLATEA denim short with floral skirt. $169.95. Desigual BOW CAPRI MAXI reversible bag. $169.95. Spring-Summer 2019. Desigual BOW CAPRI MAXI reversible bag. $169.95. Desigual TORINO CELLA bag.149.95. Spring-Summer 2019. Desigual TORINO CELLA bag. $149.95. Desigual WATER MANDALA scarf. $75.95. Spring-Summer 2019. Desigual WATER MANDALA scarf. $75.95. Desigual TIGER scarf. $59.95. Spring-Summer 2019. Desigual ZIGGY scarf. $65.95. Spring-Summer 2019. Desigual LUJAN scarf. $75.95. SS2019. Desigual FLAMINGO ROAD scarf. $75.95. Spring-Summer 2019. Desigual FLAMINGO ROAD scarf. $75.95. SS2019. Desigual NEWONE belt. $69.95. Spring-Summer 2019. Desigual Cint Xapon Bordado Far West belt. $65.95. Spring-Summer 2019. Desigual JULIETTA LOVERTY bag. $149.95. Desigual LULIETTA LOVERTY bag. $149.95. Desigual JOHANNA cotton leggings. $59.95. Spring-Summer 2019. Desigual DENIA T-shirt. $99,95. Spring-Summer 2019. Desigual KILIMANJARO sweater. $149.95. Only Sizes S & M. Spring-Summer 2019. Desigual CRISTIN dress with tropical fish print. $189.95. Spring-Summer 2019. Desigual LUCIA T-shirt. $75.95. Spring-Summer 2019. Desigual DUNIA African print dress. $165.95. Spring-Summer 2019. Desigual SIENA dress. $169.95. Spring-Summer 2019. Desigual DUNA dress with asymmetrical hemline. $165.95. Spring-Summer 2019. Desigual NEUS dress in stretch ottoman fabric. $169.95. Spring-Summer 2019. 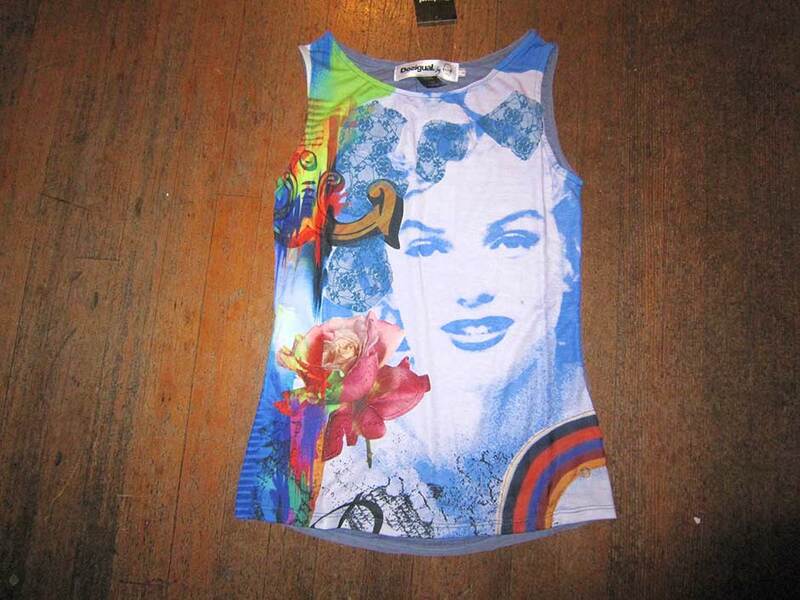 New Arrival: Desigual PATTY T-shirt. $75.95. SS2019. The entire Desigual Fall-Winter 2018 collection now is on sale at 30% to 50% off. Angel has the Barcelona brand for men, women & kids. We’re Vancouver’s first Desigual boutique. Our store is open everyday from 11 a.m. to 6 p.m., from noon to 6 p.m. on Sundays and until 7 on Friday & Saturday. Call 604-681-0947. Mick Jagger announced a few days ago that he had to cancel the Rolling Stones tour of Canada and the U.S., due to mysterious health reasons – we’re hoping it’s not serious. Here is a Stones instrumental recorded in 1964 at the legendary Chess Studios, located at 2010 South Michigan Avenue in Chicago. The Stones took a two-day break from their first U.S. tour, which wasn’t going well — they had been booed off the stage when they played a teen fair in Texas a few days earlier. The Stones didn’t yet have a hit in the U.S. and took a break to record 15 songs at Chess, releasing a five-song EP, 5 x 5, in England on Aug. 14, 1964. They recorded Satisfaction during the Chess sessions, and later added a fuzz-tone guitar. This instrumental, clocking in a 2:02 minutes, was included on the Stones first North American LP, 12 x 5. Keith Richards wrote in his biography that when the Stones first entered the Chess studio, they were surprised to find Muddy Waters painting the ceiling. Muddy also helped the Stones bring their amps in the studio. The song was built around Bill Wyman’s bass riff. And that’s Mick on harmonica @ 1:09. I first saw the Stones in 1965 in Vancouver – at the Agrodome, with Little Stevie Wonder, then 14 years old, opening. As you can probably tell, I’m fascinated by remixes. Here’s 4 producers flipping a 12-second sample of jazz improvisation of Chopin’s Nocturne in E-flat, played on the piano. The challenge: they had 24 hours to produce a song. We have plenty of Desigual parkas, winter coats, ponchos and hats and gloves to keep you warm this week during our first blast of snow and cold weather in Vancouver. Below are a few examples. Desigual winter parkas are on sale this week at 40% off, and save up to 50% on the Desigual Winter 2018 collection. If you’re heading somewhere warm this winter, Angel also has the first New Arrivals from the Desigual Spring 2019 collection, now on sale at 10% off. Desigual ATHOL jacket. Was $375.95, now 50% off $187.50. It has a colourful liner that buttons out and can be worn separately. Desigual ATHOL jacket, showing liner that can be worn separately. $375.95. Desigual FRESHK reversible PONCHO. Was $149.95, now 30% off $(105). FW2018. Desigual MANDALICIOUS hat. Was $65.95, now 30% off ($46). MANDALICIOUS gloves were $39.95, now $28. Desigual MANDALICIOUS hat. Was $65.95, now $46. Desigual MANDALICIOUS gloves. Now $28. Desigual SOFT PONCHO. Was $169.95, now $118. FW2018. Desigual PADDED PORTA jacket. Was $359.95, now 40% off – $216. Desigual PADDED PORTA. Was $359.95, now $216. Desigual FLASH coat. Was $275.95, on sale 40% off ($165). Desigual FLASH coat. Was $275.95, now $165. Desigual INDI poncho jacket. Was $255.95, now 40% off ($153). Desigual INDI poncho. Was $255.95, now $153. Desigual PARRAGA pullover. Was $115.95, now 40% off ($70). FW2018. Desigual PARRAGA pullover. Was $115.95, now $70. Desigual kids POMO hat. Was $35.95, now 40% off ($21). Desigual kids POMO hat with reversible sequins. Was $35.95, now 40% off ($21). Desigual kids ZENON coat. Was $179.95, now 40% off ($108). Desigual ANIMALS hat. Was $65.95, now $39. Desigual ANIMALS gloves. Was $39.95, now $24. Desigual man ARTHUR jacket with knitted sleeves that zip off. Was $295.95, now 50% off ($148). Desigual ALEXANDRA coat. Was $269.95, now $189 (30% off). Our store is open everyday from 11 a.m. to 6 p.m., and from noon to 6 p.m. on Sundays. Call 604-681-0947. Desigual for kids, Spring-Summer 2019 collection. Here are some of the new Desigual styles for kids from the Spring-Summer 2019 collection, which is on sale at 20% off. Desigual for kids from previous seasons is on sale up to 50% off during our Winter Sale at Angel. We ship worldwide. Desigual kids JOANA lion T-shirt with 3-D effect. $55.95. Spring-Summer 2019. Desigual kids JURGEN shark shirt with 3-D effect. $55.95. Spring-Summer 2019. Desigual JURGEN shark shirt. $55.95. Desigual kids LIAM cotton bicycle shirt. $49.95. Spring-Summer 2019. Desigual kids YAMENA dress with butterfly print over tulle, creating a 3D effect. $95.95. Desigual kids RINCMONF stellar fantasy dress with stars printed on two layers. $95.95. Desigual kids BRIDGERPORT cotton dress with tulle ruffel skirt and reversible sequins on heart. $89.95. Spring-Summer 2019. Desigual kids DOVER cotton T-shirt with reversible sequins on heart. $55.95. Desigual OSHAWA catmania T-shirt. $59.95. Desigual kids DEYANTZE turkish pants. $75.95. Desigual baby JOSEBA cotton sleeper. $35,95. SS2019. Desigual baby JOSEBA cotton sleeper. $35,95. Desigual baby JOSEBA sleeper. $35,95. Desigual DARTH STAR WARS T-shirt. Reversible sequins, 100% cotton. $59.95. SS2019. Desigual kids FOUR T-shirt. $59.95. Reversible sequins let you to choose four Star Wars characters, from a Storm Trooper and Darth Vader to R2-D2 and C-3PO. 100% cotton. Desigual kids FOUR STAR WARS T-shirt. $59.95. SS2019. Desigual kids FOUR T-shirt. $59.95. Desigual kids FOUR STAR WARS T-shirt. $59.95. Desigual REBEL STAR WARS T-shirt with Millenium Falcon spaceship on front and a rebellious slogan on the back. $55.95. 100% cotton. Spring 2019. Desigual REBEL STAR WARS T-shirt. $55.95. Desigual MARC T-shirt. $55.95. Spring-Summer 2019. Desigual SEGUR floral flared cotton skirt. $55.95. SS2019. Desigual SEGUR skirt. $55.95. Spring-Summer 2019 for kids. Desigual ENRIQUE reversible cotton sweatshirt. $95.95. Spring-Summer 2019. Desigual ENRIQUE reversible sweatshirt. $95.95. Back of the Desigual ENRIQUE reversible sweatshirt. $95.95. Spring-Summer 2019 collection for kids. Desigual FELIX cotton T-shirt. $49.95. SS2019. Desigual MASERU reversible dress. $89.95. Desigual ANTANANARIVO raspberry red dress. $75.95. SS2019. Desigual ANTANANARIVO dress. $75.95. SS2019. Desigual CARSON cotton dress. $89.95. SS2019. Desigual BOCACCIO reversible hoodie jacket. $95.95. Spring-Summer 2019. Desigual BOCACCIO reversible hoodie jacket. $95.95. Desigual OREGON cotton T-shirt with reversible sequins on the heart, ruffles & a bow on the back. $55.95. Spring-Summer 2019. Desigual OREGON T-shirt. $55.95. SS2019. Desigual NASHVILLE cotton T-shirt. $35.95. SS2019. Desigual NASHVILLE T-shirt. $35.95. SS2019. Desigual MANOLOS cotton T-shirt. $35.95. Spring-Summer 2019. Desigual MANOLOS T-shirt. $35.95. SS2019. Desigual MORONI cotton dress. $69.95. Spring-Summer 2019. Desigual kids DELAWERE T-shirt. $59.95. SS2019. Desigual kids DELAWERE T-shirt. $59.95. Desigual kids JOSEBA T-shirt. $55.95. SS2019. Desigual kids CAPTAIN AMERICA Marvel Avengers T-shirt. $59.95. SS2019. Desigual kids CAPTAIN Marvel T-shirt. $59.95. Desigual kids TOMAS baby T-shirt. $35.95. SS2019. Desigual kids LETICIA baby dress two-piece outfit. $55.95. SS2019. Desigual kids LETICIA baby dress outfit. $55.95. SS2019. Our store is open everyday from 11 a.m. to 6:30 p.m., and from noon to 6 p.m. on Sundays. Call 604-681-0947. Steven Stills auditioned for The Monkees, but wasn’t successful, Instead he went on to form Buffalo Springfield and Crosby Stills Nash & Young. Desigual for men, Spring 2019 collection. Desigual ATWOOD cotton shirt. $125.95. Spring-Summer 2019 collection for men. Desigual ATWOOD cotton shirt. $125.95. Spring-Summer 2019. Desigual VOKTOR cotton shirt. $149.95. Spring-Summer 2019 collection for men. Desigual AXEL cotton shirt. $125.95. Spring 2019. Desigual AXEL cotton shirt. $125.95. Desigual ASHER cotton shirt. $125.95. Spring-Summer 2019. Desigual ASHER cotton shirt. $125.95. Spring 2019. Desigual BOLIMANIA EHUD cotton shirt. $105.95. Spring 2019. Desigual BOLIMANIA EHUD shirt. $105.95. Spring 2019. Desigual BOLIMANIA EHUD. $105.95. SS2019. Desigual EDMUND cotton T-shirt. $99.95. Desigual BOLIMANIA EHUD, black version. $105.95. SS2019. Desigual LOLO cotton T-shirt, which spells out “Be Wild.” $75.95. Angel also as the Desigual green cotton pants. Desigual ECKARD faded cotton T-shirt. $75.95. Spring 2019. Desigual ECKARD faded blue cotton T-shirt. $75.95. Desigual ALOJ cotton T-shirt. $99.95. Spring-Summer 2019 collection for men. Desigual DAMEN cotton sweater. $149.95. Spring-Summer 2019. Desigual AURELIO hoodie jacket. $205.95. Desigual NOE cotton hoodie sweatshirt. $188.95. Spring-Summer 2019. Desigual NOE hoodie sweatshirt. $188.95. Spring-Summer 2019. Desigual BARTOLOMEO hoodie jacket. $205.95. Desigual JOEL willow green cotton pants. $189.95. Spring 2019. Desigual JOEL cotton pants. $189.95. NEW ARRIVAL: Desigual ALBERT cotton T-shirt. $105.95. NEW ARRIVAL: Desigual DARRAGH tropical print open neck cotton shirt. $125.95. Desigual DARRAGH tropical print shirt. $125.95. NEW ARRIVAL: Desigual EROS faded green cotton polo. $115.95. SS2019. Desigual EROS faded green polo. $115.95. NEW ARRIVAL: Desigual TRAZE tropical print cotton polo. $125.95. SS2019. NEW ARRIVAL: Desigual MARZO denim jacket. $255.95. Desigual KLES cotton tropical shirt. $135.95. SS2019. Desigual KLES cotton tropical shirt. $135.95.S[rong-Summer 2019. Desigual LOLO cotton T-shirt. The sewn-on letters say “Be WILD”. $105.95. SS2019. Desigual BOONE open-neck surfer cotton shirt. $135.95. Spring-Summer 2019. Desigual BOONE surfer shirt. $135.95. NEW ARRIVAL: Desigual ERENESTO postcard T-shirt. $105.95. Spring-Summer 2019. NEW ARRIVAL: Desigual ERENESTO postcard T-shirt. $105.95. SS2019. NEW ARRIVAL: Desigual ERENESTO postcard T-shirt. $105.95. Sorry, no English subtitles yet for this video featuring Brays Efe, a Spanish actor known for his role in the Netflix comedy series Paquita Salas, and Inés de León, a Spanish director, scriptwriter, actress and publicist. They are in a car on their way to the Desigual Spring 2019 fashion show in Madrid. They are discussing what is authentic today: Is there too much posing? Have Instagram filters clouded our view? Inés de León (@inesdeleon) and Brays Efe (@braysefe) tell it like it is. They are both wearing Desigual Spring 2019. The new Desigual men’s ATWOOD shirt (left) is now in stock at Angel. The first of the Desigual Spring 2019 collection has arrived at Angel – now on sale 10% off. Beyoncé posted this photo on Instagram this week. She’s standing in front of a painting by my good friend Gary Lang, a California painter. Gary and I attended art school together in the 1960s at Chouinard Art Institute in Los Angeles, which became CalArts. …………………………………………………………………………………………………………………………………. Almost Famous was written by Cameron Crowe. It’s an autobiographical account of his early years, being a 15-year-old music critic writing for Rolling Stone magazine and touring in 1973 with bands such as the Allman Brothers – called Stillwater in the movie. The movie clip ends with his college-professor mother Elaine, played by Frances McDormand, telling her class: “Rock stars have kidnapped my son.” Crowe’s mentor in the movie is music critic Lester Bangs, played by Philip Seymour Hoffman. They have a phone conversation about how uncool they are – “not like good-looking people,” Bangs explains. Colour? The first of the Desigual Spring 2019 collection has arrived at Angel – now on sale 10% off. The owner of Desigual, Thomas Meyer, created the design for these earrings – anatomically correct male and female robots – when he painted T-shirts on the island of Ibiza in 1984. You’ll see the robots this season on other styles from the Spring-Summer 2019 collection. The first of the Desigual Spring 2019 collection has arrived at Angel: Bags, tops, T-shirts, jeans, dresses and some cool jackets for women, with more coming later in the season. We also have new Desigual for women, men & kids on sale @ 20% off during our Mid Season Sale. We’re also having a Winter Clearance Sale on all Desigual – 30% to 60% off. Desigual GINEBRA yellow cotton safari jacket. Four front pockets and the embroidery on the back says “Girl Empowerment.” $269.95. Spring-Summer 2019. Desigual WALING FUCHSIA PRINT dress. $189.95. SS2019. Desigual NAGAR viscose shirt. $169.95. Spring 2019. Desigual NAGAR viscose shirt. $169.95. SS2019. Desigual KAROLEY T-shirt. $149.95. SS2019. Desigual KAROLEY T-shirt. $149.95. Spring 2019. Desigual JACKIE FLORIDA bag. $149.95. SS2019. Newly Arrived: Desigual backpacks from the Spring-Summer 2019 collection. NEW ARRIVAL: Desigual POPPY FLOWER NOVARO bag. $125.95. SS2019. Desigual POPPY FLOWER NOVARO bag. $125.95. Spring-Summer 2019. New Arrivals: Desigual “Nanaimo” backpacks in four colours. Angel has the two on the right – yellow and marine green. We can order the two on the left. SS2019. Desigual HERCULES CAPRI MAXI bag. $169.95. SS2019. Desigual HERCULES CAPRI MAXI reversible bag (it’s a tan colour inside). Added bonus: There is a second smaller bag inside (shown here). $169.95. SS2019. New Arrival: Desigual FERRARA black denim jacket. It has 100 hand-sewn mother-of-pearl buttons. Plus lots of studs. One of the star pieces of Spring 2019. $309.95. New Arrival: Desigual FERRARA jacket. $309.95. Spring-Summer 2019. The model is wearing Desigual OLIMPA black denim jeans, $169.95, which Angel has in stock. New Arrival: Desigual FERRARA cotton jacket. $309.95. SS2019. New Arrival: Desigual FERRARA jacket. $309.95. Desigual GINEBRA BARBARA jacket. $269.95. SS2019. Desigual GINEBRA BARBARA jacket. $269.95. Desigual FRANCIA skirt. $169.95. SS2019. Desigual LISA RED FOULARD dress. $169.95. Spring-Summer 2019 collection. Desigual JACKIE FLORIDA bag. $149.95. Shown with the second bag that fits inside. Spring-Summer 2019 collection. Desigual KARIN jacket with zip front. $309.95. Desigual KODA dress. $189.95. 100% viscose. SS2019. Desigual MALCOM oversized bold yellow T-shirt. $105.95. SS2019.